Abstract：In order to ensure a smooth operation for following refining, the phosphorus content in crude soybean oil should be reduced below 10 mg/kg by degumming. The deep degumming effect of 22 kinds of crude soybean oils from different origins with phospholipase A1 (PLA1) was studied. The results showed that the phospholipids composition in crude soybean oil had influences on the effect of PLA1 deep degumming. The phosphatidic acid (PA) ratio had a remarkable and positive correlation with phosphorus content in PLA1 deep degummed oil(p＜0.01). The phosphatidylcholine(PC) ratio had a negative correlation with phosphorus content in PLA1 deep degummed oil(p＜0.05). 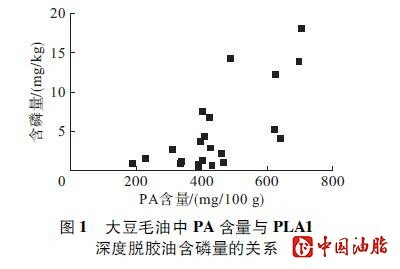 The ratio of PA to PC had a remarkable and positive correlation with phosphorus content in PLA1 deep degummed oil(p＜0.01). The degumming effect of the crude soybean oil with higher content of PA and lower content of PC was relatively poor. However, the phosphorus contents in PLA1 deep degummed oil were ordinarily below 10 mg/kg to satisfy the requirements of following refining. 蒋晓菲. 磷脂对食用油品质的影响及酶法脱胶技术的研究[D]. 江苏 无锡：江南大学, 2015. DAYTON C L G, STALLER K P, BERKSHIRE T L. Process for improving enzymatic degumming of vegetable oils and reducing fouling of downstream processing equipment: US 7713727\[P\]. 2010-05-11. DAYTON C L G, GALHARDO F. Enzymatic degumming utilizing a mixture of PLA and PLC phospholipases: US 8956853[P]. 2015-02-17. BOJSEN K, SVENDSEN A, FUGLSANG C C,et al. Lipolytic enzyme variants: US8679774 [P]. 2014-03-25. JIANG X F, CHANG M, JIN Q Z, et al. Application of phospholipase A1 and phospholipase C in the degumming process of different kinds of crude oils[J]. Process Biochem, 2015, 50(3): 432-437. GOFFERJ G, MOTULEWICZ J, STBLER A, et al. Enzymatic degumming of crude jatropha oil: evaluation of impact factors on the removal of phospholipids\[J]. J Am Oil Chem Soc, 2014, 91(12): 2135-2141. DIJKSTRA A J. Enzymatic degumming[J]. Eur J Lipid Sci Technol, 2010, 112(11): 1178-1189. GUPTA A K. Micellar structures and their implication in the chemistry and technology of fats and other lipids[J]. Eur J Lipid Sci Technol, 1988, 90(7): 251-256. 俞乐, 丛芳, 王兴国, 等. 不同来源大豆毛油磷脂组成的核磁检测及磷脂酸含量比较[J]. 中国油脂, 2017, 42(1): 130-133. 胡学烟,汪勇. 油脂中的非水化磷脂成因及去除方法的探讨[J]. 中国油脂, 2001, 26(1): 29-31. HVOLBY A. Removal of nonhydratable phospholipids from soybean oil[J]. J Am Oil Chem Soc, 1971, 48(9): 503-509. KANAMOTO R, WADA Y, MIYAJIMA G, et al. Phospholipid-phospholipid interaction in soybean oil[J]. J Am Oil Chem Soc, 1981, 58(12): 1050-1053.